Provide comfort for the family of Gary Collamore with a meaningful gesture of sympathy. Gary was born in Oklahoma City to C.E. "Charley/Pete" and Neta (McNulty) Collamore. 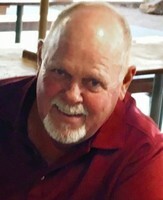 He attended OKC public schools and graduated from US Grant High School in 1972. In 1974, he began working for the US Postal Service. Over the years, he worked in different departments with the USPS and eventually became a manager. His career at the post office spanned over 30 years and he made many lasting friendships. He had fond memories of his time there. He retired in 2005 and was happy to be able to spend a lot more time with his family. Gary loved his family dearly and worked hard to provide for them. He ran a pro-bono lawn care service and had three clients; all three of his children. He liked to take care of things like that to show them how much he loved them. In his spare time, Gary liked to golf…a lot. He was a golfer in every aspect of the word. Gary even worked part-time at Broadmoore Golf Course in Moore so he could play for free, and he made the most of that situation. Gary had a close group of golf buddies that he hung around with. Sometimes, after a long day on the course, they would make a stop at the casino. On one occasion, he got lucky and won a truck, which, as you can imagine, was completely unexpected. Gary was a loving father and son, a great friend, and a Good Samaritan when it came to strangers. Gary’s presence will be missed by many but it is certain that he will never be forgotten. Gary was preceded in death by his father, C.E. Collamore. He is survived by his mother, Neta Collamore, his brothers, Phil and Chuck Collamore, and his sister, Sue Spaulding and her husband, Monroe. He is also leaves behind his daughters, Kari and Whitney Collamore and his son, Adam Collamore and his wife, Caitlin, along with their three children, Maximilian, Eloise and Winston. He will be remembered well by his many extended family members and friends. To send flowers in memory of Gary M. Collamore, please visit our Heartfelt Sympathies Store. Provide comfort for the family of Gary M. Collamore by sending flowers. I am so sorry for the family’s loss. Death is truly an enemy. May you find comfort from the future promise recorded in 1 Corinthians 15:26 which says “the last enemy, death, is to be brought to nothing.” This is a promise from God’s word the Bible and we can be certain he will fulfill his promises. Offering my deepest condolences at this time. May you find comfort in knowing that your dear loved one is resting now...merely sleeping and that soon Rev. 21:1-4 and Psalms 37:29 will soon be a reality....that soon we'll be able to see our loved ones again in a paradise earth no longer plagued with death, tears or pain. "The former things will have passed away."